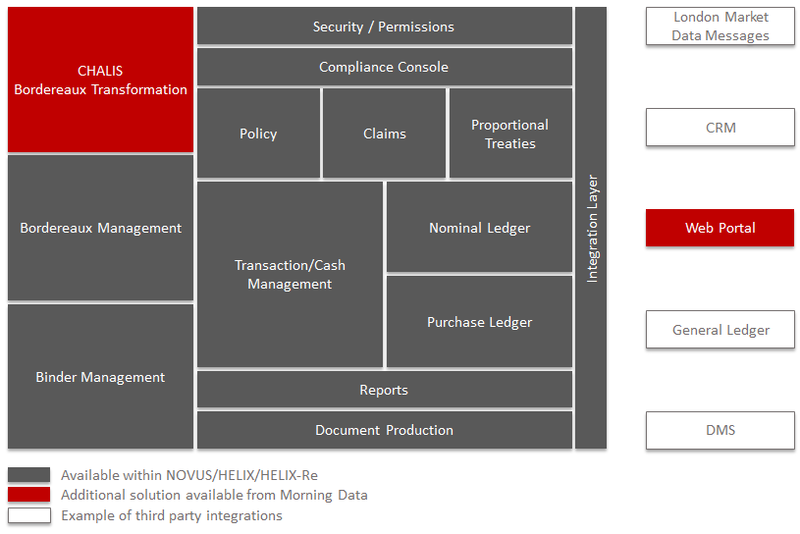 NOVUS is an integrated end-to-end insurance administration platform. The suite of available modules can be tailored to meet the specific needs of your insurance operation, whether you are a Broker, MGA or Coverholder. Fully scalable to support two to thousands of users, NOVUS will grow with you. Deployed either on premise or in the Morning Data cloud, providing your users the ability to access NOVUS from anywhere. NOVUS is an Enterprise, fully hosted solution for intermediaries wishing to run a single integrated software system handling Quotes, Policies, Markets, Cash, Claims and Reporting. Whether you are high-value/low-volume, or the reverse, handling Facultative or Reinsurance business through Treaties, Binders, Lineslips or direct, NOVUS is able to offer you a secure, flexible, scalable solution in one easy to use system. NOVUS delivers real-time data on all aspects of your business quickly and easily in the form of responsive graphical and data dashboards, reports, spreadsheets, PDFs and exportable HTML. At Morning Data we put "Ease of Use" top of the list as a key design requirement. Each and every feature, every button, every way of working is analysed and perfected until we have made our user screens as intuitive as possible. Using NOVUS means your company can perform tasks quicker and easier with less time spent on training and request support assistance. NOVUS has an exceptionally powerful compliance module that ensures you're within regulatory, process control and governance. With regulations having to be completed in a timely and auditable manner, it is critical that your users are aware of looming deadlines and that they follow the correct procedures. With NOVUS, our system will provide automated alerts and controls. Compliance Teams can be safe in the knowledge that they'll get a warning when a breach of regulation is close. The Command Console is a completely configurable module, into which you can define your own workflow requirements - the system can act as your very own sleeping policeman.